Perhaps one day our robot overlords will look back on all of the trivial things that humans made them do and take retribution on us. Until then, though, there’s no problem having them perform all of our chores. [v.loschiavo] is also exploiting our future rulers and built a robot that mows his lawn automatically as his entry into the 2018 Hackaday Prize. 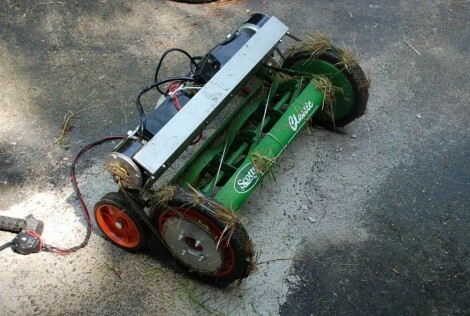 The robot uses a rechargeable battery system to drive a nylon blade for grass cutting. It also has an obstacle detection and avoidance system that allows it to find the borders of your yard and keep from getting stuck against shrubs and flower beds. And don’t worry about safety, either. There’s a built-in system of sensors that prevents any injuries from occurring. The robot also has a 10 Watt solar panel on the top that helps recharge the battery, but it can also recharge at a base station similar to a Roomba. The whole robot was 3D printed with the exception of some parts like the cutting motor, solar panel, and gear motors. While nothing except for the pictures and a general overview of the robot has been posted to the project page yet, we hope [v.loschiavo] updates the project with the G-code files, code, and schematics so we can build our own. Well here we are, we’ve reached that time of year again at which our yearly ritual of resuscitating small internal combustion engines from their winter-induced morbidity is well under way. It’s lawn mowing season again, and a lot of us are spending our Saturday afternoons going up and down our little patches of grass courtesy of messers Briggs and Stratton. Where this is being written, the trusty Honda mower’s deck has unexpectedly failed, so an agricultural field topper is performing stand-in duty for a while, and leaving us with more of the rough shag pile of a steeplechaser’s course than the smooth velvet of a cricket ground. Tea on the lawn will be a mite springier this year. A pal of [Kyle’s] was regularly leaving his sprinkler on for too long. He also had forgotten to turn the water off while topping off his pool a couple of times, an embarrassing and wasteful situation. Being such a good friend, [Kyle] offered to make him a water timer. This isn’t a regular water timer that turns the water on and off at the same time every day. This device allows the user to push a button to have the unit switch on a solenoid valve, permitting water flow. After a predetermined amount of time the unit removes power to the solenoid valve which stops the water flow, successfully preventing pool overflows and excessive watering. [Kyle] started off his design using a 555 chip to do the counting. He quickly became worried that timer lengths over 10 minutes would cause inconsistent functionality due to the leakage current of the capacitor and the charge current of the resistor. There are ways around this, but rather than complicate the design he switched to an ATtiny microcontroller. The added benefit of the ATtiny is that he could connect up a potentiometer to adjust the on-time without replacing parts or making a new unit. When the potentiometer is turned, the on-board LED will flash a number of times which corresponds with the delay in minutes. Ten flashes means a 10 minute delay. It’s a simple and clear interface. As if the home etched PCB wasn’t cool enough, [Kyle] 3D printed up a case for the unit. The case permits access to the screw terminals and has provisions for the indicator LEDs. Check out the integrated flap in the top of the case. When this portion of the case is pushed in, it presses the PCB-mounted on/off switch. If you are interested in making one, all of the files and code are available on [Kyle’s] site. [AmpEater] spent the summer converting yard equipment from internal combustion to electric power. The conversions run from a relatively tame Wheel Horse, to an insane Cub Cadet. The Wheel Horse lost its Kohler engine in favor of a hydraulic pump motor from a crown forklift. 48 volt power is supplied by MK lead acid gel cells. An Alltrax 300 amp controller keeps this horse reigned in. 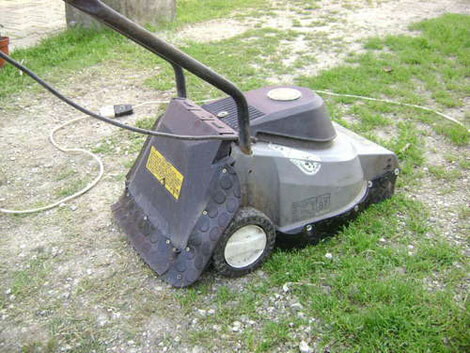 On his Reddit thread, [AmpEater] says he is especially proud of his Cub Cadet zero turn ride on mower. For those who aren’t up on lawn implement terminology, a “zero turn” means a mower with zero turning radius. Zero turn mowers use two large wheels and tank style steering to turn within their own radius. We bet this style mower would also make a pretty good robot conversion, however [AmpEater’s] zero turn is still setup for cutting the grass. After pulling the V-twin motor the 48 volt Motenergy ME-1004 was put in place. Batteries are 3 x Enerdel 48V 33 amp hour lithium ion packs. The packs are wired in series to provide 144V nominal. Right about here is where our brain started to melt. A 48V motor on 144V has to mean magic smoke, right? This is where the motor controller magic comes in. Challenged by hot days and steep turf [Grayson Sigler] modified his reel mower to use electric motors. The end product will be radio controlled but he lacked the necessary parts to make it wireless right now. Not to be deterred, he used a wired controller for prototyping and testing that should be easily replaced once the parts arrive. Sadly, the grade of his yard causes the small wheels to slip so he tried inserting screws into the tread for added traction. The small mower lacks the weight and footprint that the Lawnbot400 enjoys. That being said, solar charging is one of the future goals so this build, which he named RoMOW, wins out on the green scale. We’ve included the prototype video after the break that shows the blades spinning away. [Torx] wrote this instructable on how to convert a lawnmower to another useful tool. We’re not sure what language he natively speaks, but we doubt it is english, so you might be better off just looking at the pictures to figure out what he’s doing. To summarize, he has lowered the mower and reversed/bent the blade to scrape the ground. He has also added thick rubber edges all around to try to keep debris from coming out. You might be wondering why he would need something like this, but the last page sums it up pretty well. We could imagine this possibly getting some use in the garden as well. This one does look pretty dangerous though, so don’t blame us if you cut off a hand or lose an eye to some debris. Then again, a regular lawnmower looks pretty dangerous too.